Talk Nerdy To Me: EXHAUSTED! 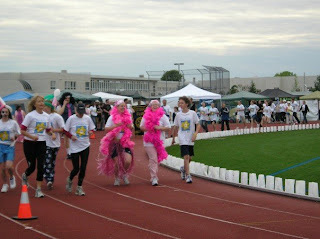 Last night we had the Relay for Life at L.S.S. (7pm-7am) My sister Maria put together a team of 8 and at least one person from the team had to be on the track at all times. They had a very honouring first lap done by all of the survivors. It was extremely emotional as everyone lined the track and clapped for them. There will little boys, moms, husbands and wives, grandma's etc. Wow. I cried for happiness for them and sadness for me. At 10:30, they lit all the candles lining the track in memory of people who have died and those who have recovered and it was beautiful and honouring. 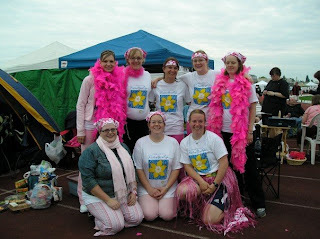 Our teams name was `Pretty in Pink' and between the 8 of us, we raised about $1800.00. Thank you to all of those that supported us! We ended up wrapping the boas around our waists, much easier to run. We left feathers all over the place. This picture is me and Maria (my sis) running the first couple laps together. Thanks to Maria VT for coming out and walking with me from 10-11pm! I have to admit that I did not stay all night as I had to get up at 6am because of my little guy and then I had to sideline a football game and then QB two games!! Long day but guess what?! We won (by more than a few points) against the 2nd and 3rd place teams! I think that they were shocked that we did so well, as were we:) What a fabulous day. There is nothing like throwing the perfect pass or running in a TD. 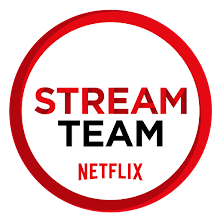 Now, its time to spend some time with the family. Gary was gone for 3 days (gr. 8 camp) and while he was gone, I had the urge to eat junk food! So strange, but I guess usually we keep eachother accountable. I ate a hotdog and drank pop. I also ate past 8pm (95% of the time we don't). I was wild. Oh ya, I stayed up late too. Reading `The Time Traveller's Wife' and really enjoying it! Have a great Saturday night all!